Utica, NY – On Saturday December 3, a fundraiser will be held at The DEV bar in Downtown Utica to benefit ongoing protests against the construction of the Dakota Access Pipeline near Cannonball, ND. The protests, which started in April, are aimed at the prevention of oil pipeline construction through ancestral land of the indigenous Standing Rock Sioux Tribe. Since then, demonstrations have grown as over 10,000 people from 400 tribal nations have taken part in demonstrations at the site where the Missouri and Cannonball Rivers meet. Taking the title of water protectors, those who have congregated do so to protect indigenous rights as well as the tribe’s access to clean water – which they fear will be compromised if the pipeline is completed. In recent months, the conditions at the main protest sites in North Dakota have worsened as both private and state repression has amplified. Hundreds of activists have been arrested, as well as several journalists, and civil rights groups in the area are calling for donations to help fund the impending legal battles to come. The benefit will also recognize local activist, Aaron Dorn, who upon bringing supplies to Standing Rock, was assaulted and arrested days later. While Aaron has been released, his personal items and property are being held by law enforcement. Proceeds from the fundraiser will also go to help Aaron’s legal fund in his fight for justice. 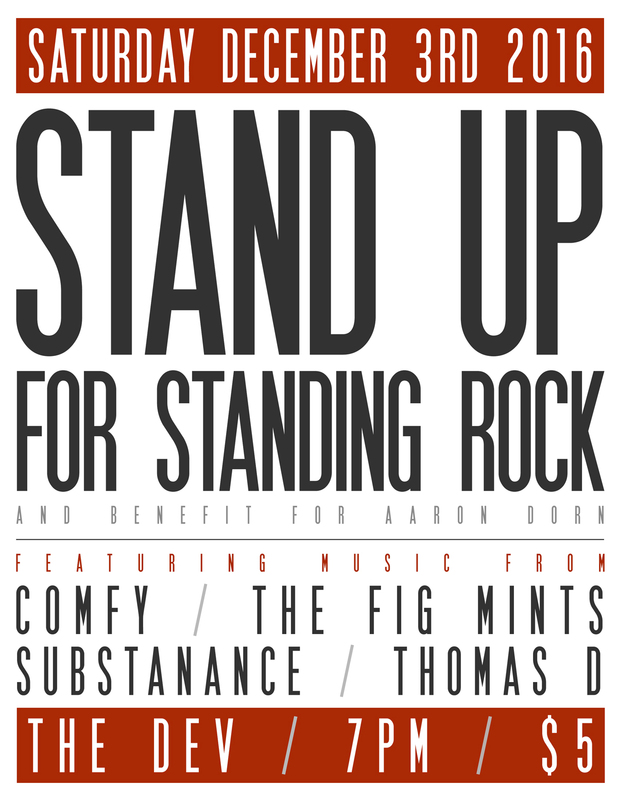 The fundraiser, Stand Up for Standing Rock, will commence at 7 PM on Saturday December 3rd. Musical acts, set to start performing at 8 PM, will also play throughout the night. A cover charge of $5 will be applied for the festivities which will include sets by Comfy, Fig Mints, Substanance and Thomas D.